While we love that the internet is bringing better knowledge of how skin works to people, sometimes bloggers and other skin care experts oversell certain products. For example, is any face mask really going to remedy serious skin issues? They may say they love it, but if they were given a product for free, it’s a lot easier to love. That’s why we look at the results of tried-and-true treatments. We want to see results, and we know you do, too! Keep reading to learn about microneedling and its at-home counterpart: dermarollers. Microneedle treatments and dermarollers both utilize the power of tiny needles that puncture the skin, creating small wounds that stimulate the skin to heal. Those tiny holes allow for deeper penetration of products, which can really give your skin a boost. 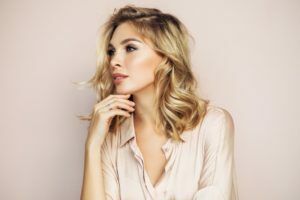 Professional microneedle treatments may also be combined with other features, like electrical currents, or platelet-rich plasma (also called the Vampire Facial). Safety is key when you’re talking about skin and needles. Professional microneedle treatments are performed by professionals who know skin and what to look for when puncturing the skin. Tools are kept clean and in great working condition. Microneedle devices also contain longer needles than you can find in stores, which means that we can provide deeper penetration (down to the dermis layer) to increase collagen production. Dermarollers, on the other hand, depend on you knowing what you’re doing. Performing a little treatment in your bathroom might be a recipe for disaster, especially if you don’t keep your dermaroller clean or in good condition. A bent needle can cause a lot of damage to your skin. Shorter needles mean that you don’t puncture the dermis layer, so you won’t be stimulating more collagen. Dermarollers can be found online or in retail stores for as little as ten dollars, though some companies are starting to package them along with products to use them with. Microneedle treatments can cost between $100 and $700, mostly because you can find many versions of treatments that utilize microneedles. Have you heard of the vampire facial or Fractora? Those both use microneedles, though they also incorporate other features into their treatments. If you’re interested in learning more about microneedle treatments, call us today at (480) 419-9605 to schedule a consultation.